Almost exactly as reported by David Legangneux two weeks ago, a Care Racing Ferrari with a difference will race at Le Mans this weekend, in the penultimate round of the FFSA GT Championship. It will be driven by 2005 FIA GT and 2006 Le Mans Series Drivers’ Champion, Gabriele Gardel of Switzerland, together with French GT specialist, Olivier Dupard. Both drivers have great experience with the Ferrari 550. 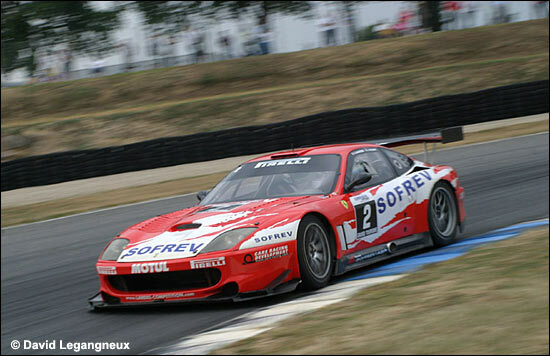 The Ferrari will be managed by newly-crowned Le Mans Series GT1 Team Champions Larbre Compétition, and will race alongside the regular Larbre-SOFREV 550 (below) of Jérôme Policand and Gabriel Balthazard who won one of the two races at Le Mans this time last year, and who are currently lying fifth in the FFSA GT Championship. The Gardel / Dupard entry will feature a newly developed “Customer” engine, which will be presented to the FFSA and to the ACO for the first time this weekend. The engine offers the same power and track performance as a standard GT1 engine but is able to run with no restrictors fitted: power is controlled electronically. Championship organisers will be able to set and regulate the power output themselves, in co-operation with the engine manufacturers. Developed by Care Racing’s long-time technical partner, Prodrive, the more user friendly engine will be available to Care Racing’s customers in 2007, and will have an extended ‘life’, the time between re-builds being considerably longer than the current 4,500 kilometres. The engine will not require a full-time engine engineer to be present with each team, thereby saving customers up to 50% over current costs. The presentation of this engine for homologation with the relevant authorities is still at an early stage, but it is hoped that the potential benefits to customers will be welcomed and accepted by the organisations involved in GT racing. The engine will therefore be presented to the FIA in the near future. Perhaps it has a future in other series next year?